Dallas: A group of scientists warn that human civilization is nearer destruction than at any time since 1953. Amid nuclear proliferation, American leadership that dismisses climate change—and in a nod to the 2016 US presidential election—the risk of fake news sparking a crisis, the end is apparently a lot closer than it used to be. 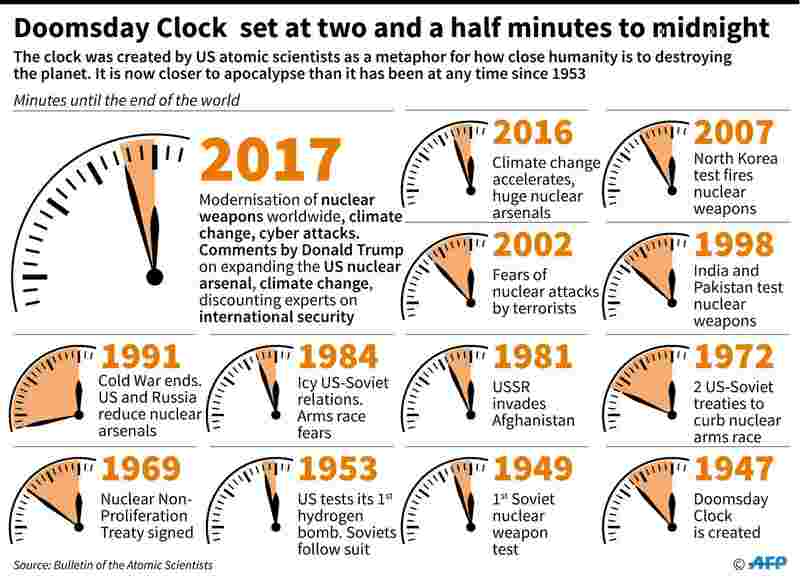 The Doomsday Clock, set by the Bulletin of the Atomic Scientists, was reset on Thursday to 2.5 minutes until midnight, a change from 3 minutes, where it was set for two years. It was the first time the organization changed the clock by a half-minute. In 2015, the group changed it from 5 minutes to 3 minutes until midnight, citing threats from “unchecked climate change" and aging nuclear weapons arsenals. “Nuclear rhetoric is now loose and destabilizing," Thomas Pickering, a member of the group and a former US ambassador to Russia and the United Nations, said today. He cited US President Donald Trump’s comments that South Korea and Japan might consider becoming nuclear states. “We are more than ever impressed that words matter, words count." The group went on to squarely blame Trump for the heightened risk of apocalypse. “He has made ill-considered comments about expanding the US nuclear arsenal. He has shown a troubling propensity to discount or outright reject expert advice related to international security, including the conclusions of intelligence experts. And his nominees to head the Energy Department and the Environmental Protection Agency dispute the basics of climate science," the group said. “In short, even though he has just now taken office, the president’s intemperate statements, lack of openness to expert advice, and questionable cabinet nominations have already made a bad international security situation worse." The Doomsday Clock was first set at 3 minutes to midnight in 1949, two years after it was established by Manhattan Project scientists who built the world’s first atomic bomb. Their idea was to create a symbol to help the public understand the various threats mankind has foisted upon itself. The Bulletin said the decision to change the clock this year came from what it views as “new" political rhetoric from both the US and Russia regarding international conflict and the role of science. The modernization and enlargement of nuclear arsenals in both countries is cause for concern, as is the tension between India and Pakistan, both of which possess nuclear weapons. Putting aside the risk of sudden global annihilation, the scientists see a slower doom that may also befall us. Last year was the warmest on record, while 16 of the planet’s 17 hottest years on record have come to pass since 2001. With an allusion to one Trump aide’s term for falsehoods about inaugural attendance, CIA relations, and voting fraud, David Titley, a climate science expert from Pennsylvania State University and bulletin member, said “alternative facts will not make the challenge of climate change magically go away." The Doomsday Clock was set at 2 minutes to midnight in 1953 after the Soviet Union tested its first hydrogen bomb, nine months after the first US test of such a device. The safest period was from 1991 to 1994, when the clock was 17 minutes from midnight. The last time the clock was as close to calamity was during the Cold War tensions of the mid-1980s. Trump hasn’t displayed the same reticence around using nuclear weapons as his predecessors. After winning the election, Trump said the US “must greatly strengthen and expand its nuclear capability until such time as the world comes to its senses regarding nukes." Trump has also said other countries should consider arming themselves with nuclear weapons. “Let it be an arms race," Trump said in late December. “We will outmatch them at every pass and outlast them all." Five nations—the US, Russia, China, France, and the United Kingdom—are formally recognized nuclear states, though India, Pakistan, and North Korea have admitted to possessing them. Israel is also believed to have such weapons. The worldwide nuclear arsenal is about 15,000 warheads, with Russia and the US each holding about 5,000.